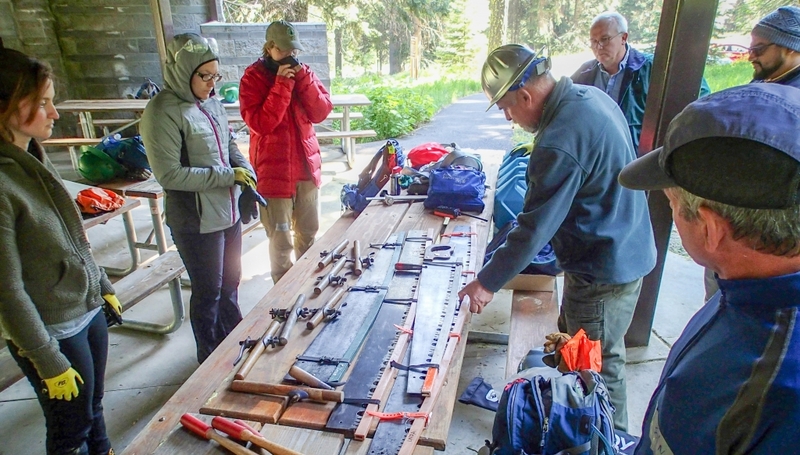 Volunteers learn basic saw crew skills at the 2018 Big Bend Trail Skills College. You’re invited! The Big Bend Trail Skills College is a free weekend event to learn about trail maintenance and stewardship. Beginners and experts alike can benefit from Trail Skills College courses like Drainage Design & Drain Dips, Basic Saw Crew Training, and Cooking and Camping with the Crew. The 2019 Big Bend Trail Skills College is possible thanks to the U.S. Forest Service, Bureau of Land Management, Oregon State Parks, and Osprey. Free tent, car, and RV camping (without hookups) is available to all participants on Friday and Saturday nights. Meals will be provided at no cost starting with breakfast on Saturday and ending with lunch on Sunday. Online registration will open soon. Check back for more details. Don’t forget, you can learn new trail maintenance skills by volunteering on a PCTA trail crew any time. Most crews do not require any previous trail maintenance experience. Knowledgeable and experienced crew leaders are on site to teach you the necessary skills. Visit the online project schedule to find trail projects near you.